Not all breakdowns require the recovery of the vehicle. Warrington Autos employ trained and experienced mechanics to attend to your broken down vehicle. 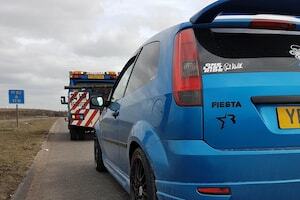 An assessment of the fault can be made and if possible a roadside repair to get your car or van back on the road again. From 3 locations we offer fast response times throughout Warrington and at motorway junctions on the M6, M56, the M60 at junction 11 and the M62. We operate recovery trucks adequately equipped with tools and engine management diagnostic equipment for mechanical or electrical repairs, a winch and lift used for 24 hour recovery of a broken down vehicle including up to 6 passengers. In addition, the trucks have an air compressor with air tools for blowing up tyres, a battery jump pack for flat batteries and other tools used for servicing, repairs, lifting or towing. Common parts and spares (incl. bulbs, fuses, diesel and petrol spare fuel, wiper blades, water, belts, oils and spark plugs etc..). We also carry traffic cones, a fire extinguisher, blankets, a child seat, high visibility clothing, mobile phone chargers, bottled drinking water and a first aid kit. "Really helpful and honest people, cannot thank them enough and will always use them in the future." "Excellent service, at an excellent price. Would highly recommend to anyone. Very friendly, approachable and accommodating." "I managed to get to the workplace car park with a dying battery and called basically IN THE MIDDLE OF THE NIGHT to book the appointment for the next hour! That's incredible. I dare someone to do the same. Will definitely recommend." "Brilliant quick pick up, Toby saved me and my son from freezing on the hard-shoulder on the way to the Trafford centre. Got to us in half an hour rather than the 3-4 hrs estimated by the RAC, great lad. Thanks so much.X"
"Had a problem with too much oil in car and aload of mad stuff happening as a result of it I originally asked to be towed to my usual garage but ended with the guy fixing it for me i cant thank him enough for it he went above and beyond what he had to .... brilliant service for a brilliant price would deffinately recommend THANKYOU !"